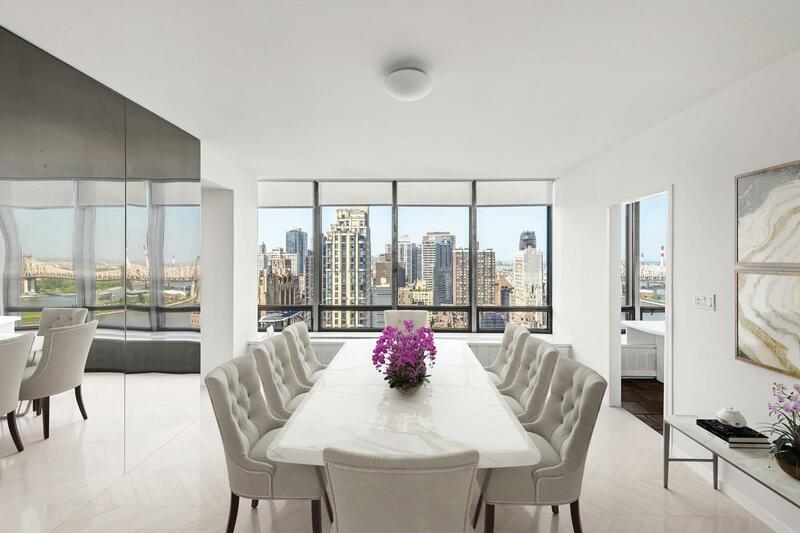 This stunning duplex apartment with spectacular panoramic views is dramatically perched on the 31st and 32nd floors of the white glove glass luxury tower 860 United Nations Plaza. 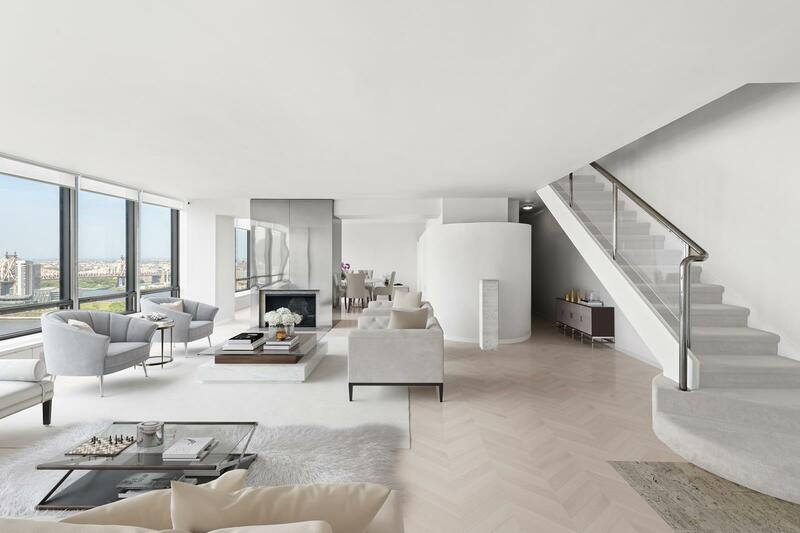 The main floor to this luxurious apartment features a fabulous entertaining space with a spectacular open and airy 27 x 21 foot living room. 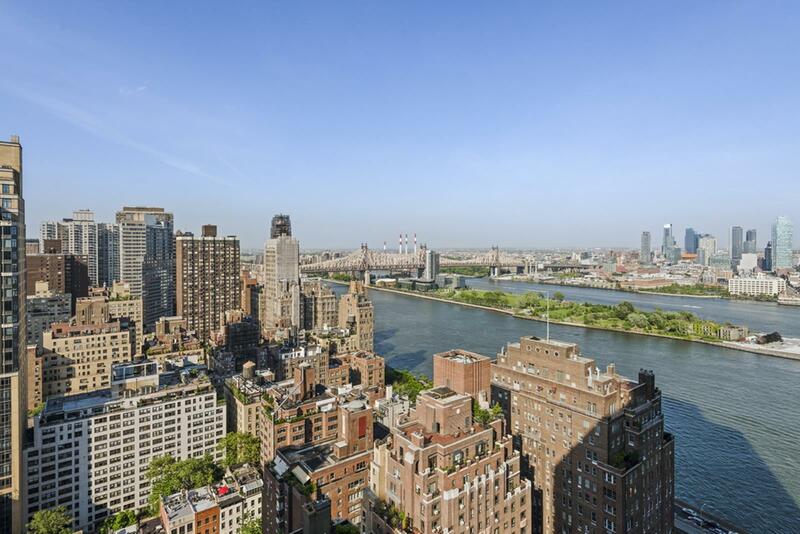 From its entire glass wall of windows with unencumbered panoramic views, you can feast your eyes on the river and sky and bask in the sunlight during the day or luxuriate under the romantic city lights at night next to your working fireplace. As an open canvas, the living room can be customized in a modern and loft like aesthetic or with a more traditional vision. The living room is framed on the right by a large formal dining room with the same spectacular views and a china closet, and is framed on the left by a library or den/media room with an ensuite marble bathroom that can easily convert into a guest suite or bedroom. The sun-flooded eat-in kitchen includes a service pantry. A laundry room with washer/dryer is situated off the kitchen next to a service entrance to the apartment and a back stairway up to the second floor bedrooms. 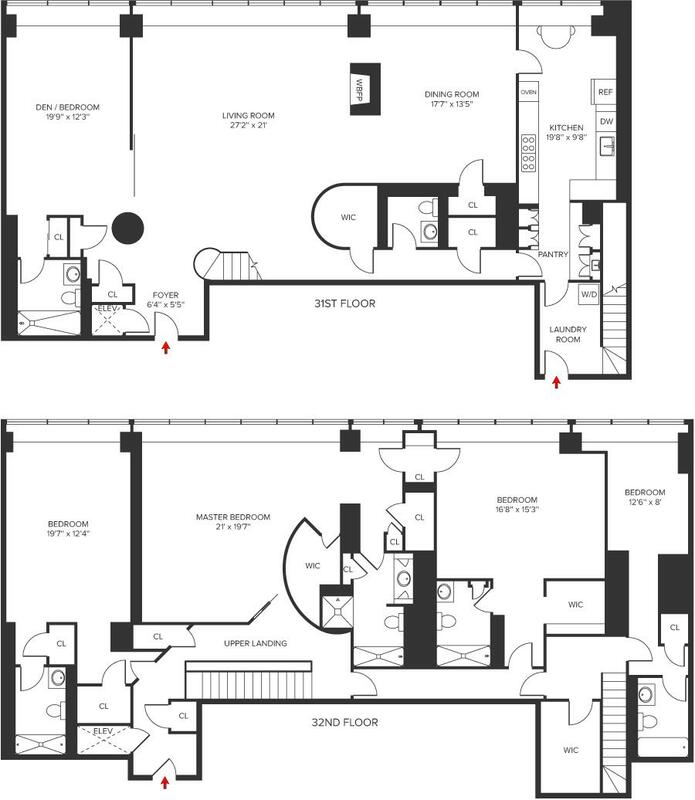 The main floor also includes a powder room and several large closets. 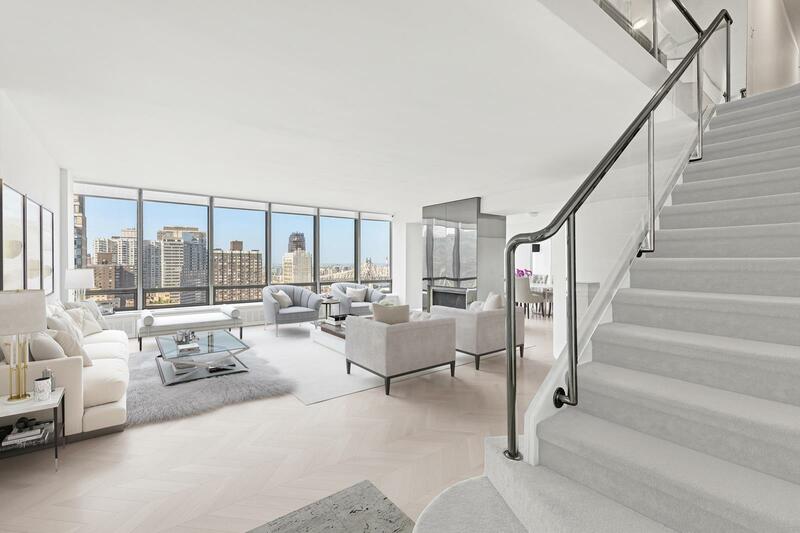 Off the living room and foyer is a glamourous and gracious carpeted and glass staircase with a stainless steel handrail that leads you to the second floor where there are four bedrooms, each of which have ensuite marble bathrooms. 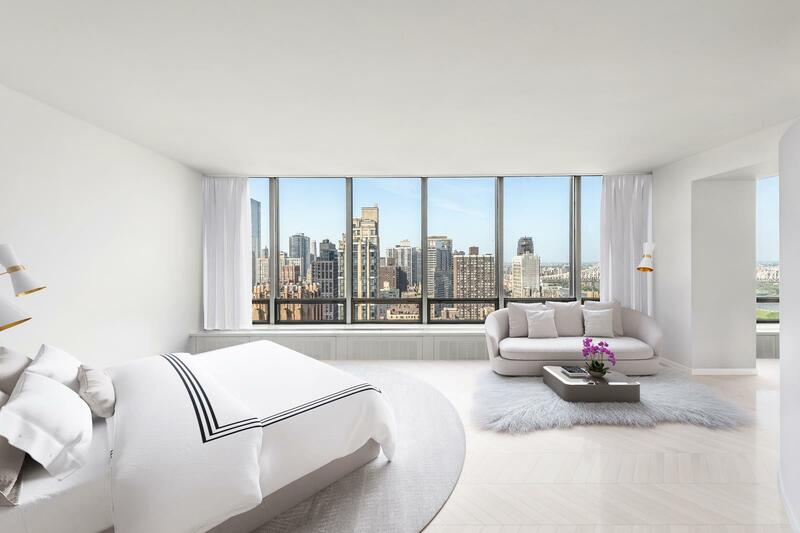 With dazzling uninterrupted views of the East River and sky, an oversized regal master suite with panoramic windows awaits with a walk in closet, two additional closets, and a marble bathroom with a separate shower and bathtub. 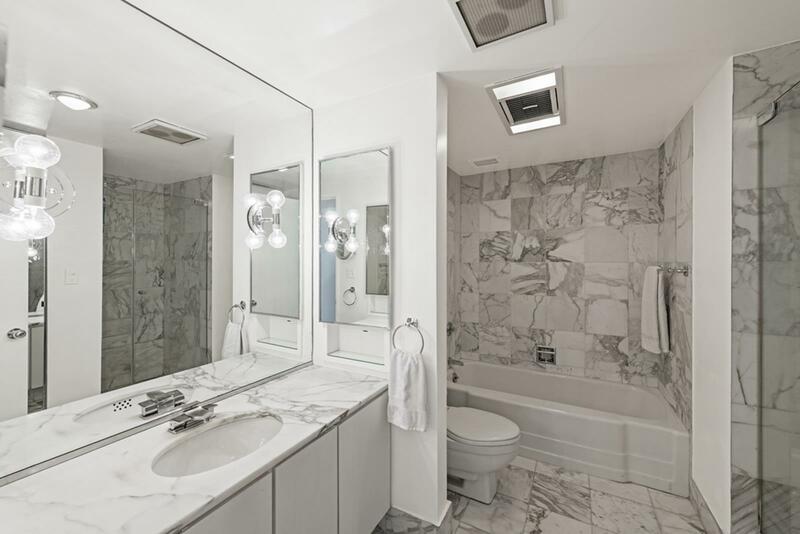 Also, on the second floor, there are three additional bedrooms, all with spectacular views, and with ensuite full marble bathrooms and spacious storage closets. The apartment has its own elevator and is furnished with window shades throughout. The prestigious and luxurious 860 United Nations Plaza was built in 1966 by the respected architects Harrison & Abramovitz, who served as the lead architects for the United Nations Headquarters complex and for other iconic buildings including The Time-Life Building at Rockefeller Center, and designed the master plan for the Lincoln Center for the Performing Arts. The UN Plaza is a full white glove coop with a fully-equipped gym, spacious sundecks with 360 degree views of the City, striking double height lobby, concierge and doormen and other numerous staff available 24 hours, a library, garage, a private full-block driveway, a newly built entertainment/party room, golf, table tennis and billiards room, storage bin that transfers with the apartment, laundry room in the basement, and access to the basement car park from within the building. Note: $2,157.53 group utilities and $67.20 window washing fees are due monthly in addition to the monthly maintenance. 3% flip tax is paid by the purchaser.